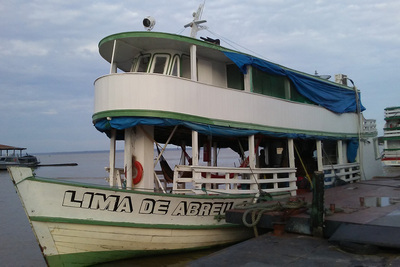 Our faithful research boat, the Lima de Abreu I, in the harbor at Tefé. 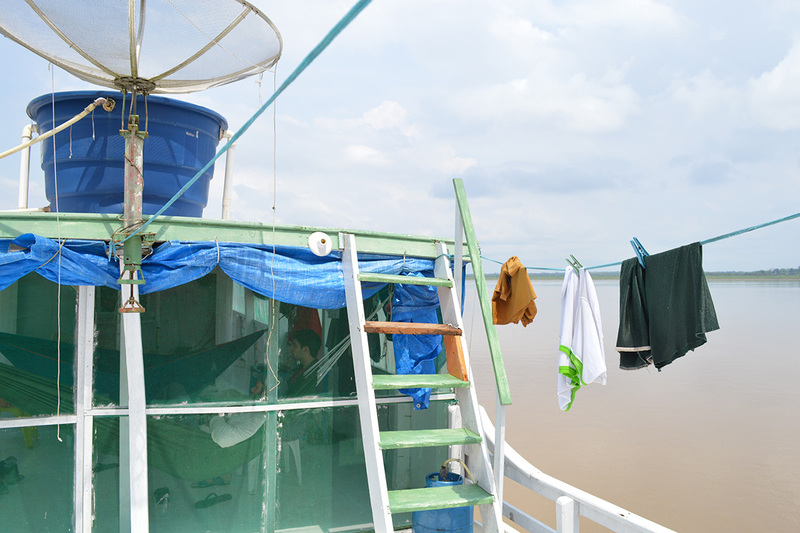 We have lived on the boat during our time on the Amazon. What are Vanessa, Julia and Jim doing in the Amazon? Read their first blog post to find out! 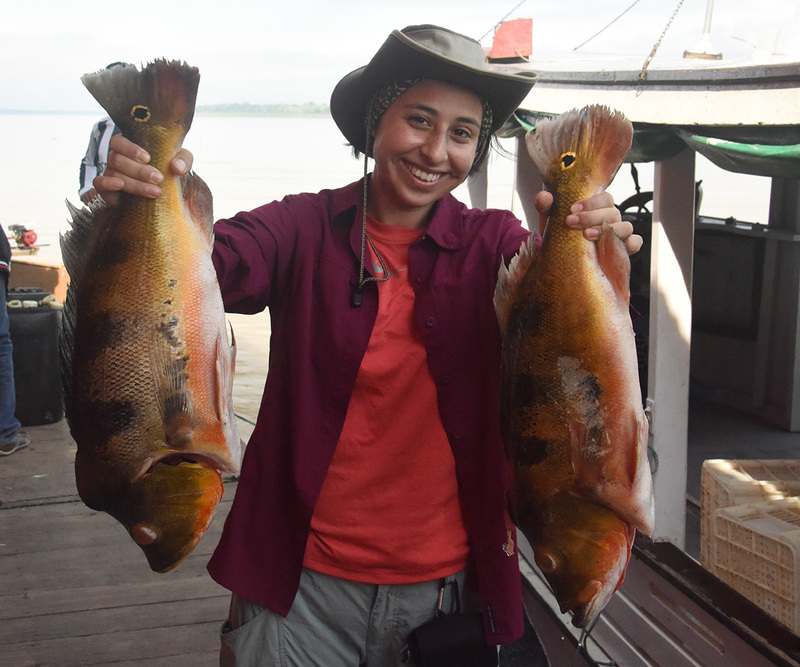 This simple root veggie has been one of the principal characters in my Amazonian experience. Manioc (also known as cassava or tapioca), as I’ve learned, is a native root vegetable, and it manages to find its way into nearly every Brazilian meal. It can be eaten raw, baked, boiled or grilled – I first encountered it sautéed over beef. Ground into a fine powder, it’s bread flour. A coarser grind is added to soup. In parts of the country, the liquid that’s extruded during grinding is enjoyed as a juice. 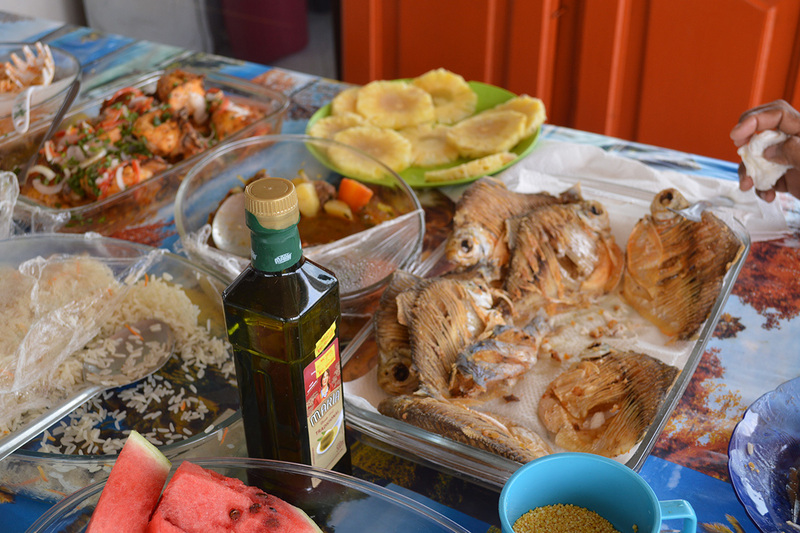 A typical dinner includes rice, bean soup, manioc, fruit, and the catch of the day. We are fortunate to have this food prepared for us every day – breakfast, lunch and dinner – by a talented and generous cook. But it is a simple fact of life on a boat that such impeccable preparation is not possible for everything. Given the confining nature of our vessel, many routines that require no thought or preparation in our everyday lives become chores on the boat. We sleep in hammocks with mosquito nets on the upper deck each night, and they occupy the entire space. Because of this, they are taken down each morning to make room for other activities, and must be re-assembled every evening. 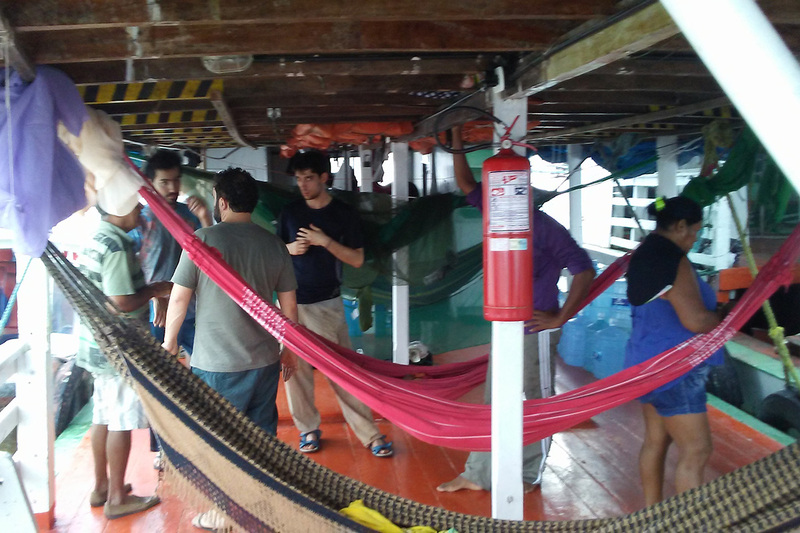 Researchers and crew gather to discuss our itinerary amid a flurry of hammocks. Space becomes crowded quickly. If a storm whips up, day or night, it is an all-hands-on-deck effort to unroll and secure the tarps that enclose the decks, to keepthe rainwater out. Difficult? No, but not so easy as pulling a window shut, either. The sleeping area of the upper deck is screened in and can be enclosed with tarps when necessary. The open area at the stern has lines for drying our field clothes. Even taking a shower requires more forethought than at home. Do I have everything I will need? Soap? Towel? Sandals? I want to make as few trips downstairs in the morning as possible, both so as to not disturb others still sleeping, and to avoid letting mosquitos into the sleeping quarters when I open the door to the lower deck – neither have walls, but the upper deck is screened in, while the lower deck is completely open. 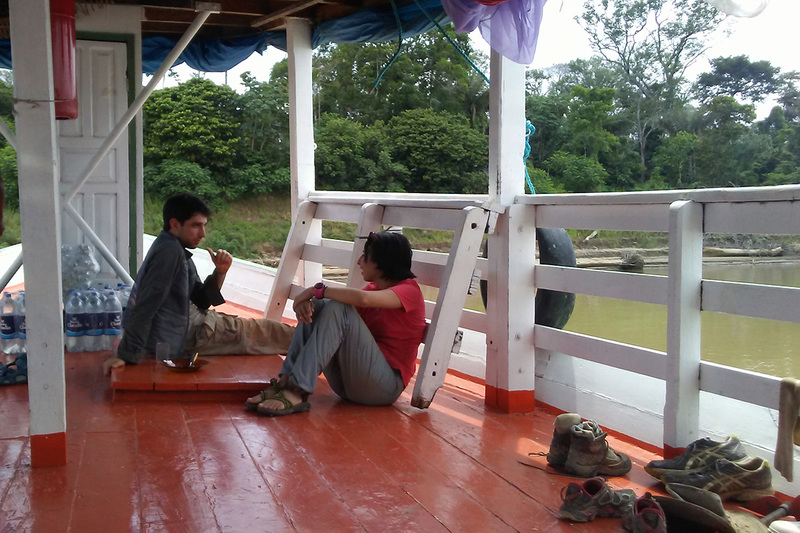 Julia and Brazilian colleague Cristiano enjoy some downtime on the boat while waiting for a thunderstorm to pass. And of course, our supplies are limited. Some days we stop to buy fish from the floating markets; other days, the crewmen fish in the morning and we dine on their catch that evening. It will be strange to return to enclosed rooms, steady floors and a mattress, and it’s impossible to say if one way of life is better than the other. 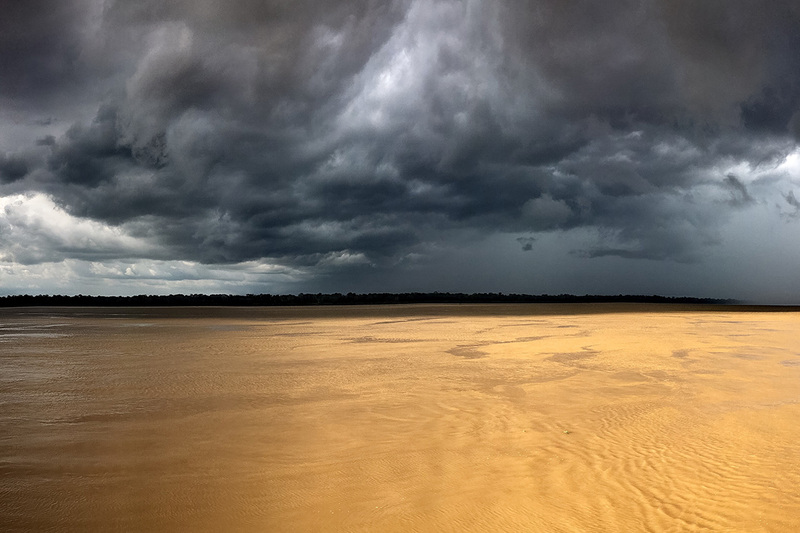 An afternoon storm rumbles over the Solimões River, better known as the Amazon.